Глубокая сковорода вогнутой формы с наклонными стенками для простого приготовления стир-фрая и любых повседневных блюд. Изготовлена из прочной, устойчивой к царапинам эмали и стали с частицами настоящего камня и меди для непревзойденной теплопроводности. Подходит для всех типов плит: электрической, газовой, стеклокерамической или индукционной. Можно мыть в посудомоечной машине. Размер: 28 см. Члены Клуба 5* экономят 23,03 € при покупке этого товара. And the results you produce will benefit from the excellent properties of Stone Legend cookware that are specifically designed to provide delicious, healthy and low-fat meals. Quantanium REAL STONE coating is sprayed in 5 layers and reinforced with natural mineral particles of stone and titanium to result in an even distribution of heat that retains more nutrients. Steel base is used for long-lasting durability that won’t alter with time. A glassy layerof enamel reinforces strength. 100% PFOA-free materials are completely non-toxic and recyclable. Because Delimano Stone Legend Wok has a uniquely structured hard but smooth and non-porous surface, you need only a drop of oil to produce healthier meals. Excellent heat distribution properties result in gradual heating that prevents burning and retains the natural vitamins, minerals, juices and nutrients in the food you’re cooking. You’re also sure to love the traditional taste that’s just like cooking on real stone. 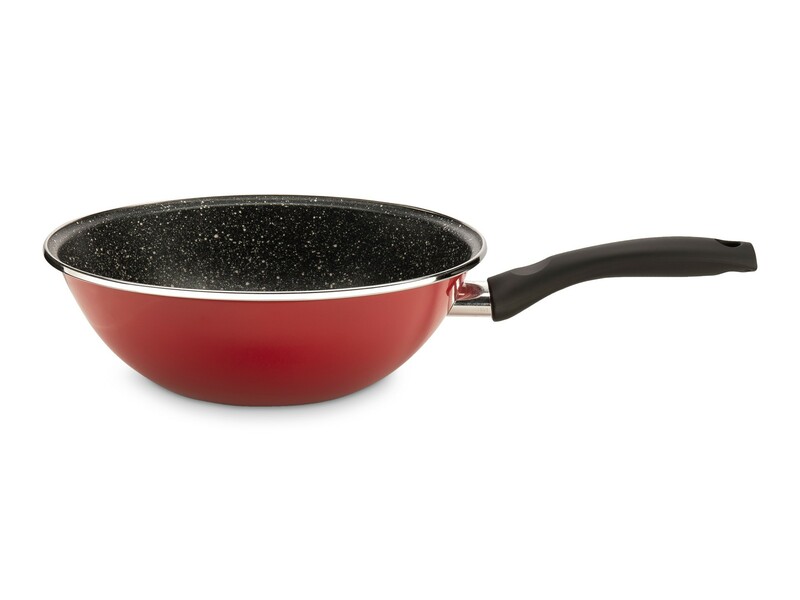 Delimano Stone Legend Wok is easy to clean and dishwasher safe. It has superior chemical and scratch resistant properties and a long lasting colour fastness that won’t fade with time.